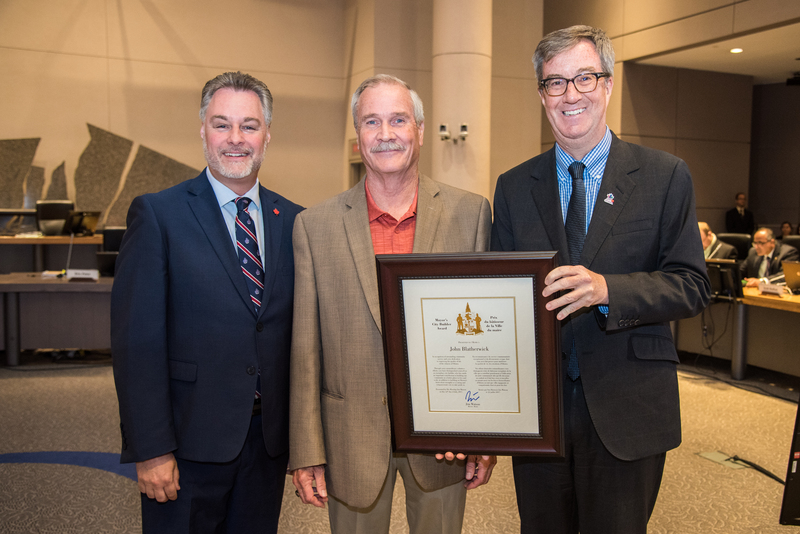 Ottawa – Mayor Jim Watson and Bay Ward Councillor Mark Taylor presented the Mayor’s City Builder Award to John Blatherwick at City Council today in recognition of his many years of service as President and Chair of the Zoning and Development Committee for the Woodpark Community Association (WCA), and for his extensive volunteer work and expertise on boards for numerous community, zoning and land-use organizations. Mr. Blatherwick’s knowledge, skills and experience in zoning and his willingness to advise associations and constituents has been an invaluable asset to Woodpark and to other community associations in west Ottawa. He is a member of the City of Ottawa Committee of Adjustment, and a former member of the City of Ottawa Business Advisory Committee. His extensive experience includes being the Past Chair of the Transportation Working Group for the Federation of Citizens’ Associations of Ottawa, and Past President, and Past Director of the Federation of Citizens’ Associations of Ottawa-Carleton. Mr. Blatherwick is also recognized as a City Builder for his contributions as a presenter at many Planning, Economic Development, Budget, Community Service, Operations and Committee of Adjustment meetings. He also contributed to the Mayor’s Task Force on Public/Private Partnerships for Affordable Housing in 2001, and has Ontario Municipal Board experience as an expert witness, appellant, presenter and community consultant (1989 to present). Previous: Previous post: Sky Lounge takes flight!